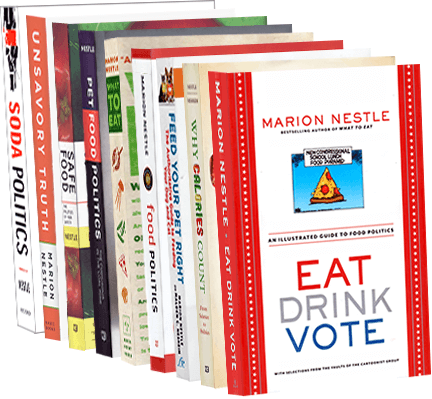 Food Politics by Marion Nestle » Let’s Move! Currently browsing posts about: Let’s Move! Jon Wiener, as it turns out, is spot on. I had not read Becoming at the time I wrote the letter but this exchange sent me right to the book. Mrs. Obama focuses on the personal and indeed presents herself as uninvolved in the political. But during the Let’s Move era, she gave a couple of decidedly political speeches about the role of the food industry in childhood obesity (here’s my summary of one of them). The Obama’s date at Blue Hill. Indeed, Michelle Obama doesn’t say much in Becoming about Let’s Move. She devotes more pages to her date with the President at Blue Hill, which I found riveting because I witnessed that date. My partner and I were taking Sidney Mintz and his wife to dinner that night and that’s where we had made reservations. The staff seated us directly across from the Obamas but, alas, did not introduce us. Cool New Yorkers as we are, we left them in peace. The Nation’s previous comments on Let’s Move: The Nation has long been critical of the way Let’s Move partnered with food companies (I’m quoted in this article). Michelle Obama: The Legacy of Let’s Move! Tomorrow afternoon, First Lady Michelle Obama will be talking about the impact of her Let’s Move! initiative to end childhood obesity in a generation. She is expected to say something there about the future of the White House kitchen garden. In the meantime, two reporters wrote accounts of her legacy yesterday (both quote me). I spoke with a dozen people who worked closely on her campaign, as well as the health and food policy researchers who studied it…I learned that some of the very things that made Michelle Obama sometimes appear soft — the industry collaborations, the emphasis on exercise — were part of the shrewd strategy that made her effective. Through her leadership, the Obama administration seized on a moment when America started paying attention to food, and made fighting obesity a top priority — both symbolically and legislatively. Obama planted a garden, waged snappy social media campaigns, and worked behind the scenes with researchers, lawmakers, heads of government departments, schools, and food giants to quietly change what Americans eat. Sarah Fritsche writes about “how the Obama administration led an American food movement” and provides an extraordinarily impressive timeline of accomplishments from 2009 on. The good news is that heart disease mortality has been falling steadily since 2009. But let’s put this in context. Here’s the long-term trend. Impressive! The report gives reasons why—mainly less cigarette smoking and better health care coverage. Where nutrition fits into this is curious. The increasing prevalence of obesity has no obvious effect on long-term trends. Perhaps the decline would faster without it? And everything else that Let’s Move! has done. There’s more to be done, but these are steps in the right direction. Sometimes I have some sympathy for the makers of High Fructose Corn Syrup (HFCS). They get such bad publicity. The most recent example occurred at the White House during the annual Easter Egg Roll, and involved the First Lady of the United States (FLOTUS), Michelle Obama. We applaud First Lady Michelle Obama’s commendable work to educate the public about nutrition and healthy diets… It is most unfortunate that she was misinformed about how the body processes caloric sweeteners, including high fructose corn syrup…Years of scientific research have shown that the body metabolizes high fructose corn syrup similar to table sugar and honey. If you’ve been following this blog for a long time, you may recall that I have a little history with the Corn Refiners. Bizarrely, I was caught up in their lawsuit with the Sugar Association. And I was not particularly pleased to find several of my public comments about carbohydrate biochemistry displayed on the Corn Refiners website. I did not want them used in support of the group’s ultimately unsuccessful proposal to change the name of HFCS to corn sugar. Enter John Bode, the Corn Refiners’ new president and CEO. As it happens, I became acquainted with Mr. Bode in the late 1980s when he was Assistant Secretary of Agriculture and I was working in the Department of Health and Human Services (yes, the Reagan administration). To my pleasant surprise, he recently wrote me “warm greetings, after many years.” His note assured me that my request to have the quotes removed would be respected and that they would soon disappear. And so they have, except for a couple in some archived press releases. Score one for John Bode. Mr. Bode has his work cut out for him. He has to teach the world carbohydrate biochemistry, restore public acceptance of HFCS, defend against Sugar Association lawsuits, stop the Corn Refiners from being so litigious, and do some fence-mending, all at the same time. And he must do all this in an era when everyone would be better off eating a lot less sugar of any kind, HFCS included. Let’s Move! announces universal school meals ! Let’s Move! is making several sensational announcements today. This one is extraordinary: Schools with 40% or more of children eligible for free or reduced-price meals will be able to serve free breakfasts and free lunches to every student in the school, regardless of family income. USDA paperwork requirements for ensuring eligibility. Parents having to fill out complicated eligibility forms. Schools having to monitor to make sure kids’ families have turned in the paperwork or paid. Schools turning away kids whose families haven’t paid. Schools destroying the meals of kids whose families haven’t paid. Students knowing who gets free meals, and who does not. Guess what: This program, which will affect 22,000 U.S. schools and 9 million children, is cost-neutral. No more tedious, labor-intensive, expensive paperwork and monitoring. More student participation means more reimbursement. This is just what school food advocates have been saying for years (see, for example, Janet Poppendieck’s Free For All: Fixing School Food in America). For this alone, Let’s Move! deserves enthusiastic congratulations. Ban the marketing of unhealthy foods to children on school grounds. Phase out on-campus advertising for sodas and junk foods at schools during the school day. Apply the ban to places such as scoreboards on football fields and in gymnasiums, on vending machines, and on menu posters, cups and plates in cafeterias. Scoreboards with Coke logos, for example, can be phased out over time. After-school fundraisers and concessions at sports events are exempt. These announcements are a tribute to the persistent work of school food advocates over a great many years. Universal meals for all public schools. Closing the loopholes on junk food marketing to kids. Ensuring compliance with school meal standards.